The holidays are all about love, connection, community, cheersing and good times. The food and the love that goes into it is always big part of all the festivities. 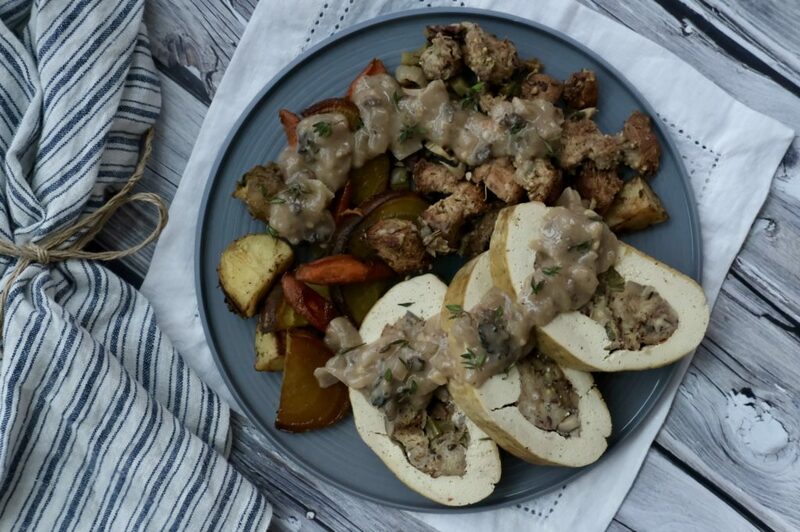 So, this Thanksgiving, here’s a stuffed tofu turkey recipe to spread the love, and fall in love with…without the cost of the turkey, Fred (he’s grateful). Turkey shmurkey. Ham shmam. Steak shmeak. 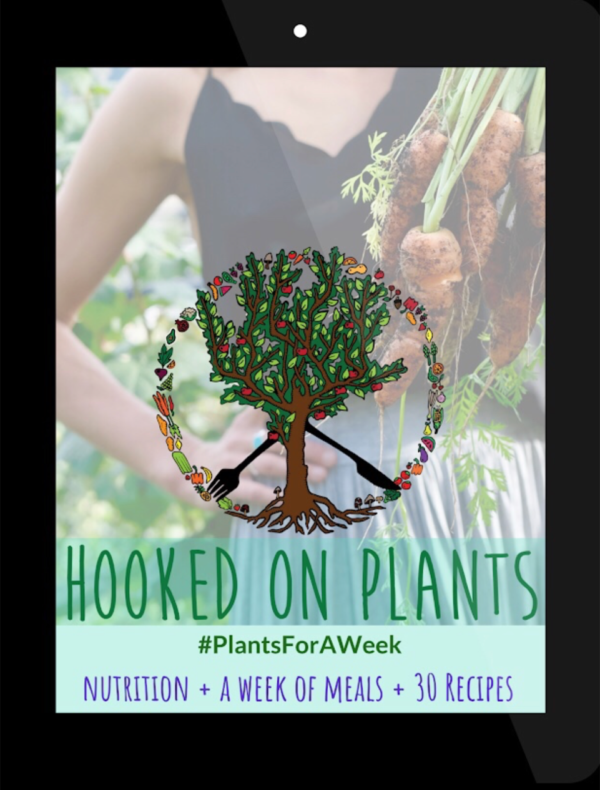 Eating plant-based during a holiday dinner party isn’t always an easy task, that is unless you bring this comfort-food recipe of a lifetime! 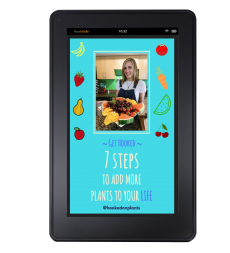 I wanted to help you create something that won’t be a compromise… and may even be just as popular at the Thanksforgivin’er shindig than your Auntie’s turkey pie! 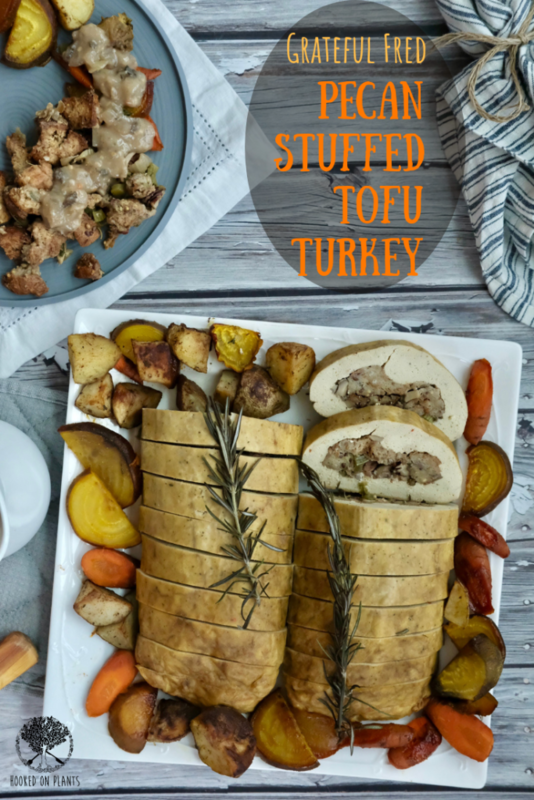 If you’re looking for a pre-made option, Gardein makes a delicious ‘stuffed turkey’ (use CRVAN-MURJUB to shop at Spud to get 2 free ones in your order), and Tofurky does too. But, if you want to go the cooking route and put as much of that love ingredient in there as possible, look no further! Fred is thankful he can live out that Turkey life of his, and the fam will be thankful that the vegan doesn’t bring carrot sticks to the comfort-food party! This turned out really well. 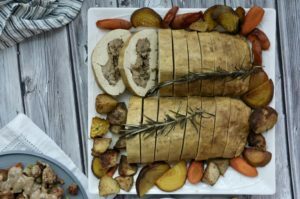 The outside is browned, the inside is tasty with pecan stuffing, and the overall feel is incredibly turkey dinner-like. Top it all off with this mushroom gravy, and this mashed cauliflower for your tastebuds to explode. Other ideas for a Holiday dinner recipes… Meatless Balls, Whole Roasted Cauliflower, Mashed Butternut Swirl, Pumpkin Pie Cheesecake, or this Apricot Butternut Lentil Loaf (an oldie but a goodie). 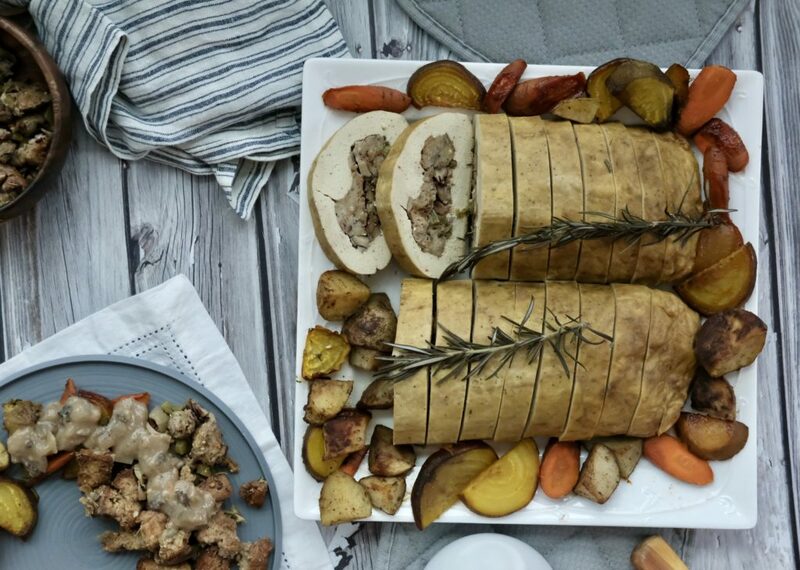 A perfect replacement for Fred the Turkey for a holiday feast! 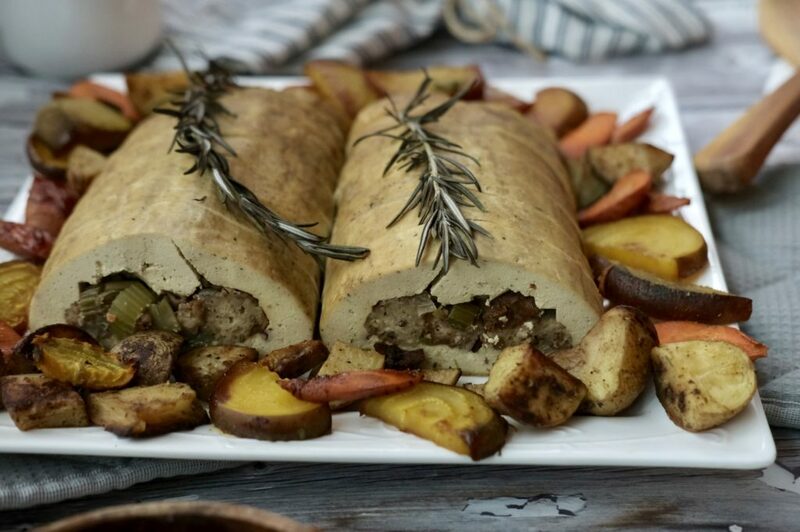 This pecan stuffing rolled up in a tofu 'turkey' will shine on the centre of the dinner table. Meanwhile, make the stuffing! 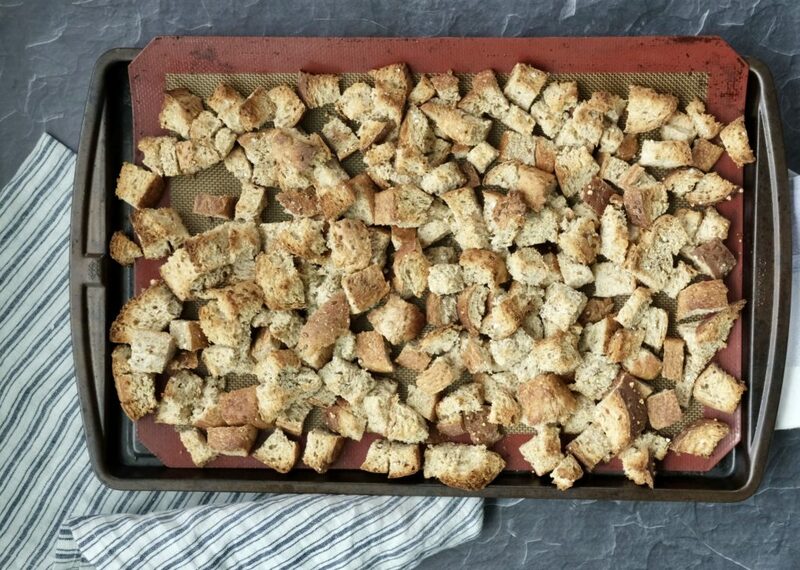 Start by spreading the cubed bread out over a cookie sheet. Bake in the oven for about 25 minutes (stir at the 10 minute mark), until it's dry...smells so good. 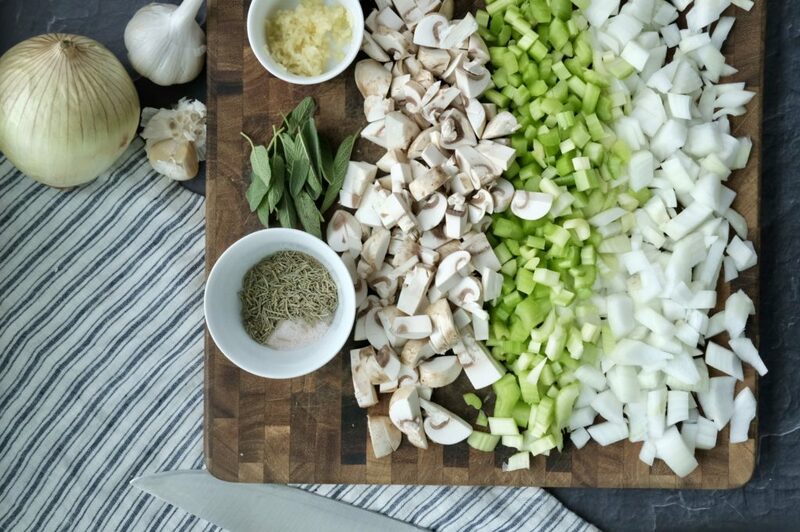 Set aside 2½ cups of stuffing for the turkey filling. Prepare your 'turkey' zone: Lay out 2 sheets of tin foil, side by side overlapping about 3 inches, with a layer of parchment on top. The parchment paper should be about 15 inches long by 13 inches wide, with the tinfoil as a border beneath it. 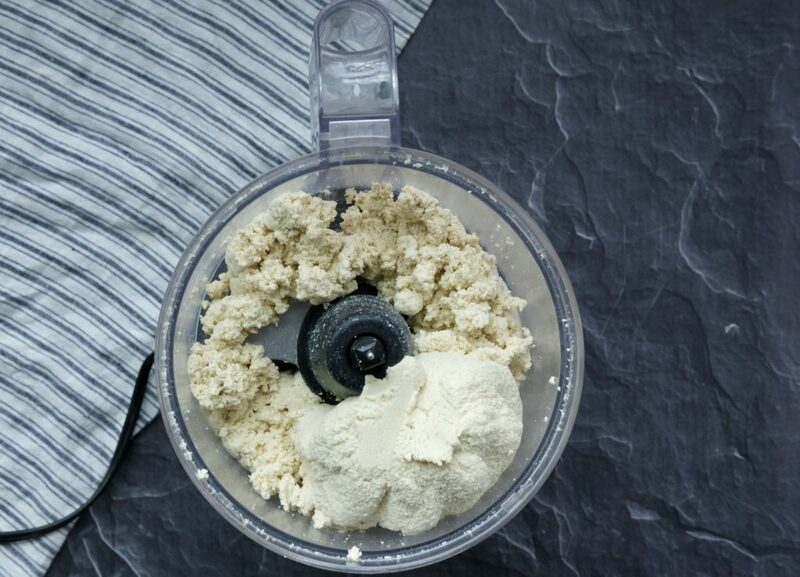 Time to make the 'turkey': To go easy on your food processor, start by blending half of all the tofu turkey ingredients together (except for the stuffing and Bragg's liquid aminos) for at least 1 minute in your food processor, or until a dough-like ball starts to form. Place that mixture as a ball on the parchment paper. Then, blend the other half of all the tofu turkey ingredients (again, except for the stuffing and Bragg's liquid aminos) in the food processor, and add it to the pile on the parchment. 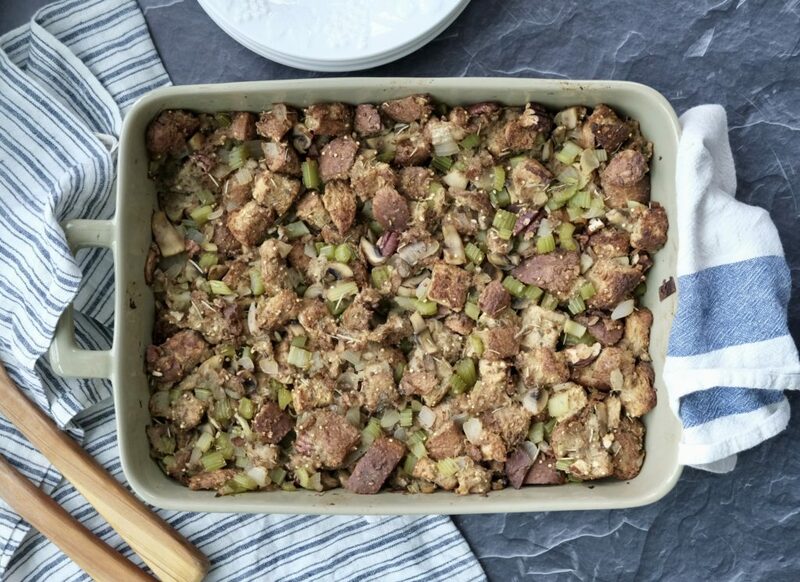 Spoon the 2½ cups of stuffing into the middle of the tofu rectangular 'turkey' in a lengthwise tube shape. Use the parchment paper to roll one side of the tofu turkey over the stuffing, then the other side until the tofu turkey just overlaps. Give it a nice squeeze to make sure it's all overlapping by at least 1 inch. Unwrap it and fold the ends. Use your fingers to press down any open areas, or cracks. Pour Bragg's liquid aminos over top and use basting brush to cover the whole turkey. Let cool 15 minutes, then place in the fridge. When you're ready to serve it, take it out of the fridge, slice in 1 inch slices, wrap it back up and bake for 20 minutes at 350°F. Serve with the mushroom gravy from this recipe and this cauliflower mash! Happy Holidays! The Turkey's thank you! *If you want to make it right before, just skip the fridge part, and keep it in the oven for another 15-30 minutes, then slice when it comes out! Tag me make this! (@hookedonplants on instagram)! I love seeing your recipes. 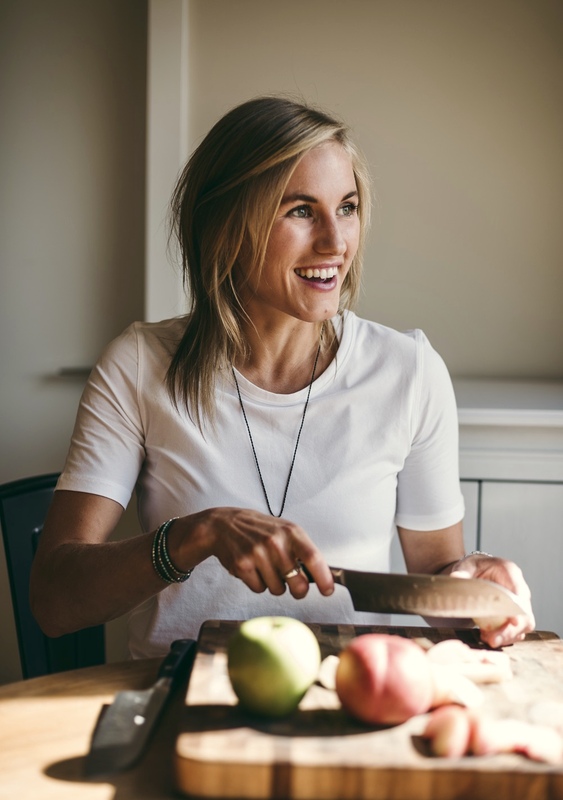 This week’s email is all about the most important thing to be grateful for… yourself, and what you should do about it.